73 yo healthy appearing female presents with constant, deep L flank and LUQ pain. + multiple episodes of N/V, mostly food particles w/o blood. She denies any urinary changes, hematuria, fevers, chills, recent illnesses, constipation, headaches, or recent trauma. Gen: Well appearing, appears uncomfortable. HEENT, cardiac, lung exam WNL. Abdomen is soft and non distended with mild tenderness in LUQ, no masses. + L CVA tenderness. Extremity, skin and neuro exam are unremarkable. U/A: Multiple species of organism present. Probable contamination. 1. What does this image depict? Ans: This image depicts a normal RUQ view including the R kidney in sagital view. Note no free fluid is present. 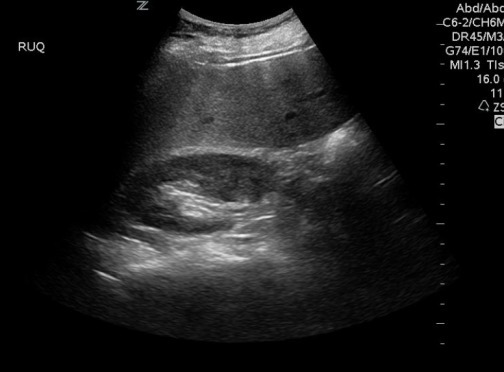 Morrison's pouch is clearly visualized and the liver is normal in appearance. 2. What do the 2 images below depict? Do these images guide your clinical judgement? Ans: These images depict a normal mid aorta view with SMA present as a landmark. The size is normal. The sagital view is normal. No sacular aneursyms are present. AAA is an important diagnosis to consider in any middle aged individual presenting with flank pain. 3. What do the images below depict? How would you describe these findings? Does this finding help explain this patients clinical presentation? Ans: The above images depict moderate hydronephrosis of the left kidney. Ultrasound is a sensitive tool useful for detecting the hydropnephrosis early in your workup if you clinically suspect obstructing kidney stones or other urologic pathology such as UPJ obstruction. Hydropnephrosis appears as a bear claw with the hypoechoic areas w/o flow on doppler. 4. What positive finding is present below? And: There is a kidney stone present on the bottom left of the hypoechoic bladder in this image. It appears hyperechoic and has significant posterior shadowing present which helps to differentiate this appearance from artifact.